Situated in the picturesque Avon Valley, Annie’s Landing Estate is one of Ellenbrook’s finest villages. Annie’s Landing takes its inspiration from the surrounding historic towns within the Avon Valley. Architectural styles are in simple form with a high level of detail on the feature elements such as pitched roofs, face brick and local stonework from Toodyay. Living in Annie’s Landing Estate, you get the semi-rural spoils from Avon Valley’s rural landscape, combined with Ellenbrook’s design principles of a modern, residential community with the benefits of a bustling regional town centre just 10 minutes away and Swan Valley’s wine region also a short drive away. Item 1 – Painted steel ‘Fan’ artwork. Completed October 2014. Item 2 – ‘Ring with Jewels’ 3.3m high x 1.7m wide with fabricated jewels and lighting. Completed February 2015. 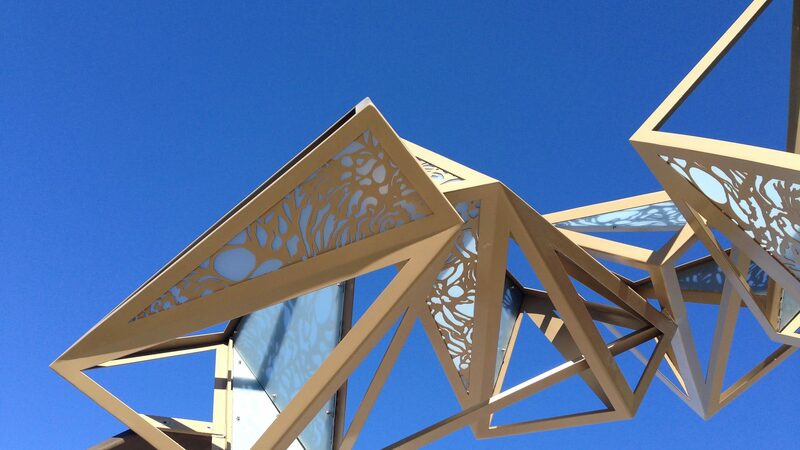 Item 3 – ‘Bridge Sculptures’ 8m high x 4no steel laser cut, painted finish with lighting. Completed March 2015. Item 4 – 2 off ‘Fixed Gates’ 7m wide x 2.4 high pic perforated including lighting. Completed August 2015.